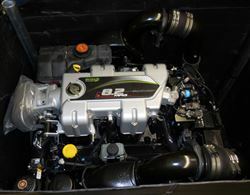 Really great special deals on genuine Mercury Mercruiser engines limited to the stock we have on hand. 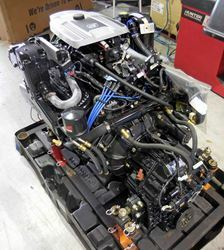 SOLD - See our HO model Complete engine, ready to install in the boat. We bought these on a special deal and are passing the savings on to you. Full factory warranty! PRICE REDUCED!! 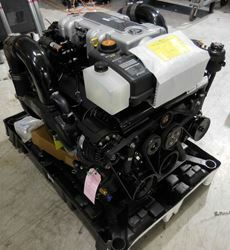 New OEM Mercury Part number 4-40820057V Mercruiser 8.2L MAG HO Bravo DTS Engine Complete and ready to install. Full factory warranty! 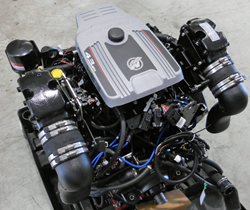 End of season price reduction - New Mercury Mercruiser 377/6.2 MIE (inboard) DTS with Hurth 630V 2.0:1 Transmission, ready to install! The engine comes with a 1 year Mercury factory warranty. Please ask about Mercury Product Protection plans to extend your warranty. Like New Mercury 8.2L MAG ECT Bravo MPI Engine 6 in Risers. Manufacturers Test Engine with 13 hours in Fresh water use. Sold with full Warranty. This engine has been sold, thanks for looking!! SOLD Complete ready to install 4.3 with multi-port EFI. This engine is no longer made. It has been replaced by the new Mercruiser 4.5. Please contact us for details.